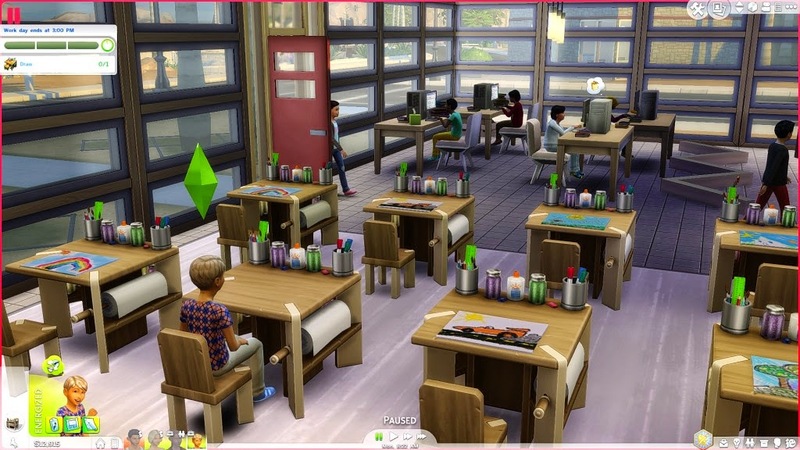 "If you have both The Sims 4 and The Sims 4 Get to Work Expansion Pack, The Sims 4 Go to School Mod Pack allows you to follow your Child and Teen Sims to school. The mod contains two new venue types: Elementary School and High School. You can download an existing school from the gallery, or create your own, in any location in the existing worlds. A normal day at Elementary School has four main goals: Draw on the Activity Table, Play the Violin, Practice Typing at the Computer, and Experiment at the Chemistry Table. Each goal consists of using these interactions for 15 minutes. Your Sim will be given two goals at once you can choose from, which will continuously cycle between these four goals. However, when your Child Sim actively attends school for the first time, they’ll be given an introduction day. Your Sim must complete each of the four goals only once, and then they’ll be given the goal to socialize and get to know classmates. The third day at school will always be a field trip, so all Sims will get a chance to experience one, even those not lucky enough to roll one randomly. Field trips will be explained in greater detail below. After the third day, random field trips and events can start happening. The High School is still being planned and the details of it haven’t been locked yet, but much like Elementary School, your Sim will be assigned a series of goals. The exact goals haven’t been decided yet, though most will involve skill building. There are also plans for introduction days like with Elementary School, but the exact details of them haven’t been decided yet. When a Sim leaves to actively attend school, there is a random chance that they’ll be sent to another lot on a field trip. Both Child and Teen Sims can be sent to a Library or Museum. Teen Sims can also be sent to a Gym. Each venue has its own set of goals to complete. The chance of rolling a field trip increases depending on the Sim’s grade. grade F Sims have no chance of a field trip, and grade A Sims have the highest chance. When a Sim has an A grade, the “Rentable” venue type becomes available as a field trip location if you have Outdoor Retreat installed. Want a free field trip to Granite Falls? Then work hard and increase your grades! For B and A grade Sims, there is a weekly Collection Hunt, on Friday for Child Sims and Tuesday for Teen Sims. Sims will be sent to a random lot in the world, and will be assigned goals to pick up collectibles and take photos. For A grade Sims, the Collection Hunt is completely unrestricted: Sims can be sent to any lot in the game that isn’t an owned residential lot. Will your Sim be sent to Forgotten Grotto? The science lab? The forest at Granite Falls? Or just the old Willow Creek downtown area? It’s completely unpredictable! Every Wednesday, Costume Day is held at the Elementary School. On this otherwise normal school day, Sims will come dress in costumes. Have fun being surrounded by hot dogs, bears and weirdly dressed Sims! Of course, the mod isn’t all about working hard and succeeding. There’s also something for Sims who would rather be off having fun. 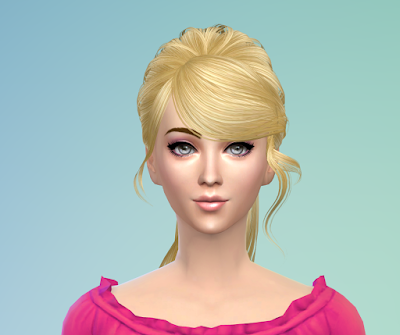 This mod brings a brand new skill for Child and Teen Sims, the “Hookie” skill. When a Sim has an F grade, there’s a random chance they’ll choose to skip school and send an (off screen) hologram to do all their work! While Sims are doing this, they will continuously build the Hookie skill. Being Energized or Focused increases the skill gain speed, although it’s a challenge to stay this way, since Sims will have a +4 Tense Moodlet because what they’re doing is risky – you’ll need to have enough fun to override it. Once a Sim has reached level 2 of the Hookie skill, they are no longer required to be an F grade in order to skip school – they can randomly choose to do so any time. To start with, Hookie will always take place on the home lot and the surrounding public space. As the Hookie skill increases, there will be more lots available for a Sim to be randomly sent to, until it’s eventually completely unrestricted. * NOTE: Right now, parts of the mod (field trips to Rentable lots, the unrestricted Collection Hunt and high levels of the Hookie skill) depends on the fact that the game doesn’t block hidden lots and destination worlds from being chosen for career events. I can’t guarantee that this won’t change in future patches. If it ever does, I’ll try everything I can to fix it, but even then I can’t promise, so try not to get too attached to events that take place Granite Falls or hidden lots. I hope you all have fun with the mod when it’s released! If any of you have any questions or suggestions, please feel free to leave them in the comments! I can’t guarantee that everything suggested will make it into the mod, but I’m trying to make it as big as possible. Not everything about the mod has been finalized, so there might be more features than is being announced here!" I'm super excited for this Mod.What about you?? ?